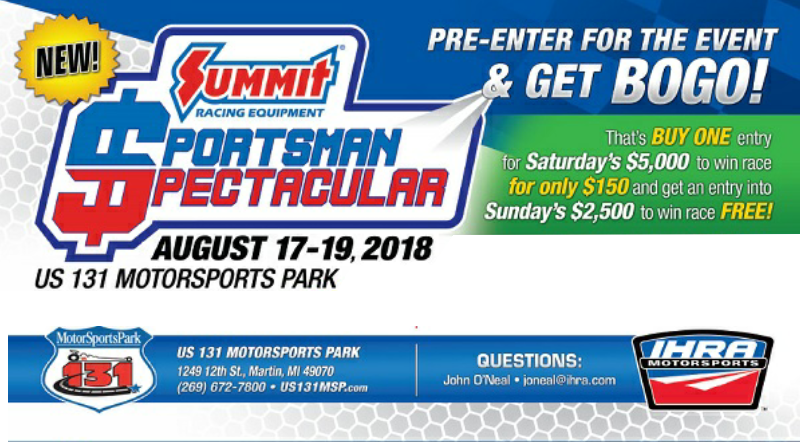 WEST PALM BEACH, Fla. — The exciting International Hot Rod Association (IHRA) Summit Sportsman Spectacular heads to the “Fastest Track in Michigan” US 131 Motorsports Park, Martin, Mich., August 17-19. Ensure your chance of taking home the top prize of Moser Engineering Saturday and Scrubblade Sunday by pre-entering the exciting race weekend. When you pre-enter and buy an entry for Saturday’s race, you will get a free entry for Sunday’s race. A $100 savings! Pre-entries are available until Monday, August 6. Click here to pre-enter the thrilling race weekend so you don’t miss your chance to take home the top prize! Event is tailored specifically to meet the US 131 Motorsports Park points program including separate classes for Box, No Box, Street and two classes of JR Dragsters. The national contingency program is available for all IHRA members who advance to the final two rounds each day. Summit Racing Equipment will now pay Summit Racing gift certificates for the win, runner-up and semifinal positions. But, that’s only part of an extensive prize package. Cash bonuses are up for grabs for the IHRA Summit SuperSeries memberthat goes the furthest in eliminations or wins the event. Weekend round prizes for the best losing package of each round are available from great IHRA partners Summit Racing Equipment, Sunoco Race Fuels, Moser Engineering, American Race Cars, Abruzzi Transmissions, and Jones Transmission Cooling System. Visit IHRA.com and US 131 Motorsports Park for more information.